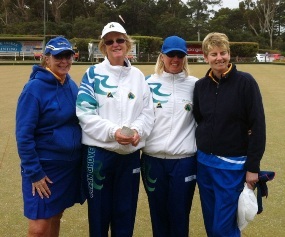 Congratulations to Torquay's Suzanne Lund and Karen Harrington who joined with Lorraine Myers and Joan Tennant from Ocean Grove to take out the Women's State Fours competition, played at Torquay Friday 14th November, 2014. In the semi final played in the morning they had a convincing win over a Geelong RSL team led by Lynette Sutton. The final saw a closer match against a Leopold team skipped by Nicole Shortis. They will play in the Bowls Victoria Championship week against other Region winners, to be held at the Bendigo East Bowls Club from Sat 18 Apr to Fri 24 Apr 2015. Torquay Bowls Club is hosting the Women's State Fours competition and there was great bowling to be seen yesterday Nov 13th in the elimination rounds. Two Torquay teams were in the running, the team of Sandra Skene, Maureen Gribble, Lyn Kitchin & Kaye Robison won through to the 2nd round, but were defeated by an RSL team. The composite team of Torquay's Suzanne Lund and Karen Harrington with Joan Tennent and Lorraine Myers were too strong for a Highton team skipped by Wendy Ballentine and also an Ocean Grove team led by Marls Sutton, with convincing wins over both. They will now play in the semi finals being played today Friday 14th from 10.00am, hopefully getting through to the final this afternoon.